It would be easy to ignore the report of Parliament’s public enterprises committee inquiry into State Capture at Eskom, given the testimony bombs dropping at the Zondo Commission. That would be a mistake. While there may not be a big-bang smoking gun, the parliamentary inquiry report clearly outlines in fact and testimony the systematic capture of a public entity such as Eskom for the gain and self-enrichment of private interests. That the public enterprises committee adopted the 142-page inquiry report on Wednesday is by no small measure due to backroom manoeuvring and just plain stubborn determination. There was pushback to play kick-for-touch to keep the report under wraps, according to two parliamentary insiders. The inquiry had finished over six months ago. It would have been easy to play kick-for-touch as Parliament rises for 2018 in just a week or so. The fact that it has been adopted – and adopted with unanimous agreement across party-political lines – is kudos for Parliament. That the pressure had been on became clear as in unusual fashion each and every MP was allowed to express support – usually adoption is simply moved and seconded – and there was a brief light moment for a group photo. The report does not mince words and traces the State Capture line from political bosses like ministers, through boards that failed their fiduciary and governance responsibilities, to top executives and senior mangers just a level below. “… (T)he corruption of procurement processes at Eskom would not have been possible, if not for the guise of integrity and legitimacy that some erstwhile reputable entities afforded certain Eskom decisions. Such entities benefited greatly from the tainted contract and enjoyed advantageous relationships with the implicated companies,” said the inquiry report. And so former public enterprises ministers Malusi Gigaba, who headed the portfolio from November 2010 to May 2014, and Lynne Brown, in charge from May 2014 to February 2018, are found to have been “grossly negligent in (their) responsibilities”. Also listed are former board directors Viroshini Nairoo and Pat Naidoo alongside ex-CEO Brian Molefe, former chief financial officer Anoj Singh, former acting CEOs Sean Maritz and Matshela Koko, the head of generations who resigned on the eve of disciplinary proceedings over an undeclared conflict of interest as his daughter had won contracts from Eskom. All testified before MPs, sometimes in marathon seven- or eight-hour sessions, like Brown, who appeared almost to the day a year ago after having raised objections to the inquiry’s purpose, mandate and composition. 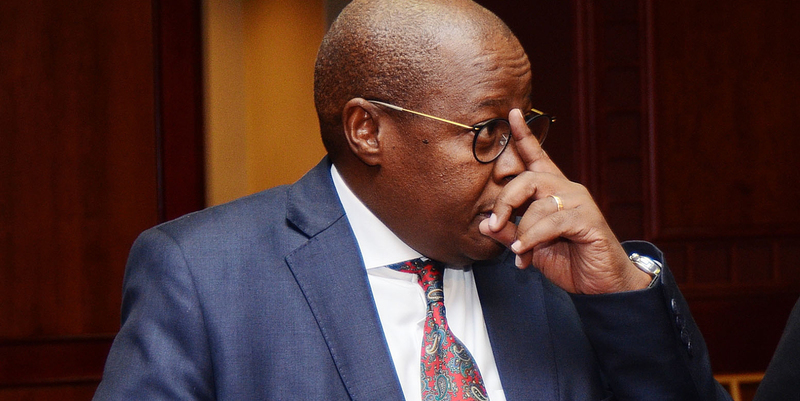 Or Molefe, who denied any wrongdoing over his R30.1-million pension benefit after less than two years into a five-year contract, that would have disqualified him from any Eskom pension because he was not a permanent employee. Or Singh, who despite being CFO claimed not to have known very much even about the pre-payment for future coal supplies from Tegeta that effectively facilitated that Gupta-linked company’s acquisition of Optimum coal mine. Parliament’s public enterprises committee inquiry into State Capture at Eskom almost seemed to have evolved by accident. The inquiry was not established through a motion of the National Assembly like the 2016 parliamentary SABC inquiry, but followed from a June 2017 directive to four committees by the House Chairperson Cedric Frolick to investigate claims of the #GuptaLeaks and report back to the House. That directive came on the back of a sustained public outcry over State Capture that upped the political pressure. Although former public protector Thuli Madonsela had issued the State of Capture report in October 2016 – it found the need for a commission of inquiry under a judge to be appointed by the chief justice, not the president as is traditionally done – then president Jacob Zuma had taken the report on review to court. Only in December 2017 did the North Gauteng High Court dismiss the review, a ruling that cleared the path to the Zondo Commission. But by mid-2017 the public pressure was keenly enough felt for Parliament to believe it needed to do something. Hence the directive to look into the #GuptaLeaks and State Capture claims to the four parliamentary committees. Of those, transport failed to launch, mineral resources held one meeting in October 2017 with then still mineral resources minister Mosebenzi Zwane, who denied everything, while home affairs dragged its feet until a recent change of committee chairperson in April 2018 moved matters along, although by now the minister, Malusi Gigaba, has resigned as had veteran director-general Mkuseli Apleni, who resigned to join the private sector in July 2018. Only the public enterprises committee moved to inquire fully. After fits and starts, including securing resources, it got fully going in October 2017. And over the course of just more than three months of public hearings, scheduled where and when possible in a pressurised parliamentary calendar, much of those #GuptaLeaks were confirmed as was former public protector Thuli Madonsela’s State of Capture report. “Many of the findings and observations of the public protector’s State of Capture report have time and again been corroborated by the evidence before and the testimony of witnesses that appeared before the committee,” said the inquiry report. And so Parliament’s public enterprises committee inquiry into State Capture at Eskom sets out what happens, through fact and testimony under oath. It has gone further in unravelling the connections that have haemorrhaged billions of rand into private pockets from SoEs that were meant to drive South Africa’s development agenda. That Eskom is still battling with the consequences emerged on Wednesday when the power utility released its integrated interim results, from growing debt to failing infrastructure and the prospect of yet another consecutive year of above inflation tariff hikes. MPs are not investigators, and so the criminal and civil matters, like declaring directors delinquent in terms of the Companies Act, must be left to regulatory and law enforcement agencies. That those are letting the side down is clear. It is on public record that the Hawks do not have internal forensic auditing or accountancy capacity, and must outsource while also filing some 250 vacancies. And even when the Hawks investigate, as they did in the Vrede dairy farm scandal involving Free State agriculture officials and Gupta-linked companies, the criminal justice system is full of self-defeating potholes. On Wednesday the NPA withdrew the charges because it had not received information from India and the United Arab Emirates as requested, a reason DA MP Glynnis Breytenbach described as “flimsy at best, and wholly unconvincing” in a statement. That NPA move came a day after the Hawks told MPs of Parliament’s police committee, how it had grouped together various State Capture-related cases, including the Vrede farm. The Hawks presentation listed the 11 accused to be back in court on 4 December 2018 on charges of fraud, corruption and money laundering involving R283-million. There are several other State Capture investigations, from the 1,064 Transnet locomotive acquisition that led to the payment of R16-billion in finders fees to a Gupta linked company, or what was called “misrepresentation to the Eskom pension fund”, involving R11-million, although it’s not clear who is being probed – the presentation simply says “Eskom board”. Molefe had been ordered to repay the monies. And more than 800 statements have already been taken in relation to Eskom Tegeta dealings, also involving an advisory service of the Gupta-linked Trillian to international consultancy McKinsey; the matter is “still under investigation”. This is where the challenge in nixing State Capture lies. That is not something the Zondo Commission can fix, nor is it something the parliamentary inquiry report can do.